Discover the creative power of raging seas, of Force-9s and undercurrents, of tidal pull, hidden depths, unknown treasures, and uncertain homecomings, of the sense (literal, metaphorical, emotional…), of stepping off terra firma and into the unknown, the elemental, the unfathomable. Not just writing poetry, fiction, and memoir about seaside days and safe harbours, but the real oceanic deal, the seven seas that cover two-thirds of our world’s surface. Experience the creativity of Anne-Marie’s themed workshops where tasks and talk, writing exercises and sources of inspiration from literature, the visual arts and the wider world, will fire your writing and have you producing real results in terms of finished works and new drafts. This will also leave you with a head fizzing with new ideas and new directions! You will also do your own writing and receive positive feedback from energized fellow writers. Plus, Anne-Marie offers advice on how to be your own best critic, on editing your own work, and on workshopping with fellow writers. 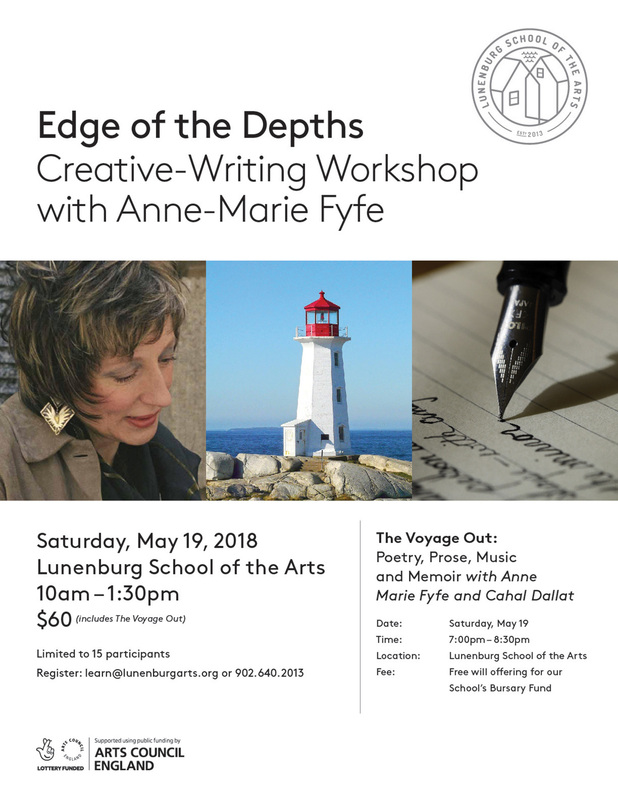 Participants will also have the opportunity to take part in an evening performance with Anne-Marie as she presents her own writing, The Voyage Out. Poet Anne-Marie Fyfe presents readings, talk and music on writers and the sea, from great novelists, travel-writers and poets of the past. Come and take in the constant, recurring presence of the sea in Anne-Marie’s poetry, and listen to new work from her current writing/travel project, combining poetry and prose memories of growing up, of life by the sea in Cushendall, Ireland, and of other coastal locations she has experienced on her travels. Plus, fresh new writing presented by those who participated in Anne-Marie’s workshop earlier in the day followed by the live performance of sea-music by Cahal Dallat (accordion/mandolin/flute).